A Mattress Maker’s Daughter richly illuminates the narrative of two people whose mutual affection shaped their own lives and in some ways their times. According to the Renaissance legend, told and retold across the centuries, a woman of questionable reputation bamboozles a middle-aged warrior-prince into marrying her, and the family takes revenge. He is don Giovanni de’ Medici, son of the Florentine grand duke; she is Livia Vernazza, daughter of a Genoese artisan. They live in luxury for a while, far from Florence, and have a child. Then, Giovanni dies, the family pounces upon the inheritance, and Livia is forced to return from riches to rags. Documents, including long-lost love letters, reveal another story behind the legend, suppressed by the family and forgotten. Brendan Dooley investigates this largely untold story, among the various settings where episodes occurred, between Florence, Genoa, Venice. 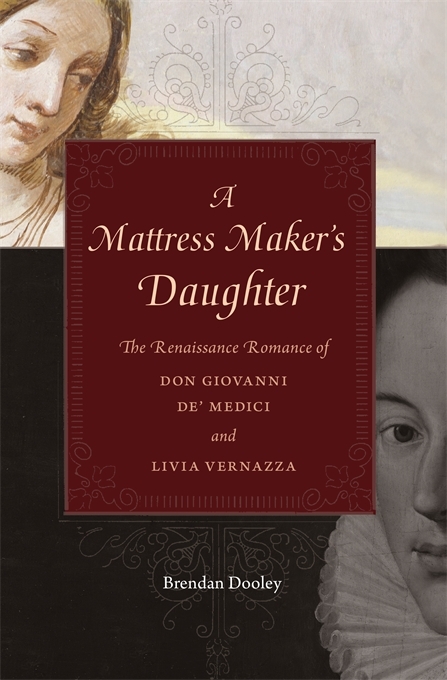 In the course of explaining their improbable liaison and its consequences, A Mattress Maker’s Daughter explores early modern emotions, material culture, heredity, absolutism, and religious tensions at the crux of one of the great transformations in European culture, society, and statecraft. Giovanni and Livia exemplify changing concepts of love and romance, new standards of public and private conduct, and emerging attitudes toward property and legitimacy just as the age of Renaissance humanism gave way to the culture of Counter Reformation and Early Modern Europe.